Miguel Perez, Jr. is a professional wrestler who competed as a member of the Los Boricuas stable led by Savio Vega from June 1997 to October 1998 in the World Wrestling Federation. Pérez is the son of the Miguel Pérez, Sr. and is best remembered for his brief stints in Extreme Championship Wrestling and World Wrestling Federation. 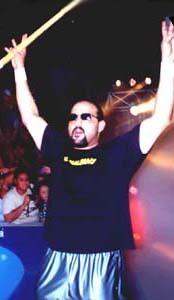 Pérez briefly appeared in Extreme Championship Wrestling in 1993 and teamed with both Mr. Danger and Crash the Terminator, and both teams unsuccessfully feuded with the Head Hunters over the W*ING World Tag Team Championships. Pérez also had a very short feud (again teaming with Mr. Danger) against "Hot Stuff" Eddie Gilbert and the Dark Patriot for the ECW World Tag Team Championship, but was unsuccessful again. Pérez is currently working for the International Wrestling Association in Puerto Rico. On November 1, 2009, Pérez and Vega participated in a Dominican Wrestling Entertainment card, being booked to win the DWE World Tag Team Championship. For the first time in his career Perez won his first world championship by defeating Joe Bravo to win the IWA Championship. - WWC Tag-Team Title Tournament (June 29, '86) = Perez Jr & Huracan Castillor J took down Hiroshi Hase & Fumihiro Niikura, then fell to Eric Embry & The Crusher. The Rock-n-Roll RPM's won the tournament. - WWC 14th Anniversary Show (September 20, '87) = Perez Jr pinned the Crusher. - WWC Gillette Cup Tournament (February 27, '88) = Perez Jr lost in the first round to the Black Ninja (Mutoh). Carlos Colon won the tournament. - WWC 15th Anniversary Show (September 10, '88) = Perez Jr & Huracan Castillo Jr won a "Hair vs. Hair" Match over Bobby Jaggars & Dan Kroffat. - WWC 16th Anniversary Show (October 7, '89) = Perez Jr & Huracan Castillo Jr lost the WWC Caribbean Tag-Team Titles to Jerrow Morrow & The Cuban Assassin. - WWC 17th Anniversary Show (July 7, '90) = Perez Jr & Huracan Castillo Jr retained the WWC Caribbean Tag-Team Titles, winning over Ron Starr & The Cuban Assassin. - WWC 18th Anniversary Show (July 6, '91) = Perez Jr & Huracan Castillo Jr defeated the Samoan Swat Team. - WWC Universal Heavyweight Title Tournament (August '92) = Perez Jr fought to a Double Countout with Mr. Hughes. Greg Valentine won the tournament. - WWC 19th Anniversary Show (August 8, '92) = Perez Jr fought to a Double Disqualification with Abdullah the Butcher. - WWF Summerslam '97 (August 3) = Los Boricuas (Perez, Jesus Castillo, Jose Estrada, & Savio Vega) defeated the Disciples of Apocalypse (Crush, Chainz, Eight Ball, & Skull). - WWF One Night Only (September 27, '97) = Los Boricuas (Perez & Savio Vega) lost to the WWF World Tag-Team Champs, the Headbangers. - WWF Badd Blood '97 (October 5) = Los Boricuas (Perez, Jesus Castillo, Jose Estrada, & Savio Vega) were beaten by the Disciples of Apocalypse (Crush, Chainz, Eight Ball, & Skull). - WWF De-Generation X (December 7, '97) = Los Boricuas (Perez, Jesus Castillo, & Jose Estrada) took down the Disciples of Apocalypse (Chainz, Eight Ball, & Skull). - WWF Wrestlemania XIV (March 29, '98) = Los Boricuas (Perez & Savio Vega) competed in a "Tag-Team Battle Royal", which was won by The Legion of Doom 2000. - WWF Judgment Day '98 (October 18) = In a dark match, Los Boricuas (Perez, Jesus Castillo, & Jose Estrada) fell to the Oddities (Golga, Kurrgan, & Giant Silva). - IWA Tag-Team Title Tournament (January 7, '00) = Perez & Nuevo Gran Apolo lost in the first round to the Headbangers. Ricky Santana & Val Venis won the tournament.